Whether hanging guitars on the wall will be ok for your guitar will depend on a couple of different things. It will also depend on the kind of lifetime you expect for your guitar. Will Hanging my Guitar Damage it? Probably the most accurate answer to this question is yes. However, it will take a long time to cause any damage – assuming you are hanging them properly. Your guitar is constantly having force exerted on it. The tension of the strings exerts a lot of force – a lot more than the weight of the guitar hanging ever could. The amount of force that your strings exert varies depending on a couple of things such as the string gauge and the scale length of the guitar. Roughly anywhere between 90lbs (very light gauge strings) to 180lbs (heavier gauge strings) are being exerted onto an acoustic guitar. That’s a lot of tension and your guitar is designed to be able to deal with all of that. You can check out the string calculator at the link below if you want to work out exactly how much force your strings are putting on your guitar. The average weight of an acoustic guitar is between 5 and 7lbs. Compared to the tension from your strings this is very little. The average weight of an electric guitar is around 7-11lbs. Again this isn’t much compared to string tension. So Will Extra Damage be Caused by Hanging? The best answer to this is yes, eventually. In your lifetime? Probably not – so long as you are hanging it properly. In the guitar’s lifetime? Assuming something else doesn’t damage the guitar first, then the extra tension from hanging will eventually speed up the guitars demise – but it will take a long time. What About Guitar Stores Hanging Their Guitars? Because they are in the store for a very short time relative to the life of a guitar this will make zero difference so you don’t need to worry about a guitar hanging in a store – even if it has been hanging there for a good while. If you’ve decided to hang your guitar then you want to make sure your guitar is safe – and easy to access. Firstly, make sure you get a guitar specific hanger. You want your guitar to be sitting correctly and preferably you want something that prevents your guitar from jumping off the hanger (however unlikely – though more likely if you are inn earthquake prone zone or if you have kids!). The video below is an example of how to install one particular model of guitar wall hanger. As mentioned in the video above, one of the biggest benefits of hanging your guitar is that it makes it easily accessible. If you leave it in your case it’s just not going to be as easy to pull out and play. Of course you can use a floor stand for this same purpose. I know from experience that using a stand of some description makes the likelihood of me picking up a guitar and playing it far more likely. Even though it’s not really a big thing and it doesn’t take long to take a guitar out of a case, there is definitely a psychological barrier there. Another benefit of hanging your guitar on the wall is that not only is it easier to access but it also serves as a reminder to pick it up and play it. Finally, hanging on the wall – as opposed to a floor stand – might be your best option if you are short on space. 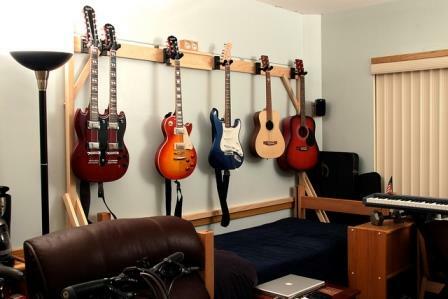 If you live in a small apartment (like I do) then you might struggle to find space for your guitar – the wall is the perfect place to keep your guitar without taking up floor space. I hope this post has helped you to understand the effect that hanging your guitar on a wall can have and the benefits of doing so. Do you hang your guitar? Are you considering it? Are you still worried about the effects that hanging might have or are you comfortable with hanging your guitar? Any comments or questions very welcome in the comments section below. My aunt is thinking about getting her son a guitar. However, she’s worried about whether he actually remember to practice. I think she’ll like that idea of mounting it on the wall since it makes sense how that can serve as a reminder to pick up your instrument and play. Force has magnitude and direction. You only accounted for magnitude. Given the force of strings vs wall hanging is in opposite directions, this should reduce the overall force exerted, and by my assumptions, increase the lifespan of the guitar. Thanks for your input. I hadn’t thought about that. I’m no physicist, so I can’t grasp that concept completely, but it sounds plausible.